The Popol Vuh, or Popol Wuj in the K’iche’ language, is the story of creation of the Maya. Members of the royal K’iche’ lineages that had once ruled the highlands of Guatemala recorded the story in the 16th century to preserve it under the Spanish colonial rule. 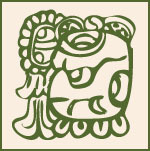 The Popol Vuh, meaning “Book of the Community,” narrates the Maya creation account, the tales of the Hero Twins, and the K’iche’ genealogies and land rights. In this story, the Creators, Heart of Sky and six other deities including the Feathered Serpent, wanted to create human beings with hearts and minds who could “keep the days.” But their first attempts failed. When these deities finally created humans out of yellow and white corn who could talk, they were satisfied. In another epic cycle of the story, the Death Lords of the Underworld summon the Hero Twins to play a momentous ball game where the Twins defeat their opponents. The Twins rose into the heavens, and became the Sun and the Moon. Through their actions, the Hero Twins prepared the way for the planting of corn, for human beings to live on Earth, and for the Fourth Creation of the Maya.